Welcome to those of you joining me from My Dreams of Disney and those of you just hopping aboard. I am the Final stop on our Magical Blogorail. 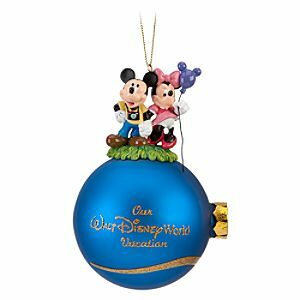 Today we are sharing our favorite Disney souvenir and it will come as no surprise to you that mine is a Disney Christmas ornament. I got it on the last day of our Walt Disney World trip in 2003, my first Walt Disney World vacation. I bought it from Ye Olde Christmas Shoppe in Liberty Square. I walked around the store taking my time choosing the perfect ornament because I knew it would be a long time before I would be visiting again. I was definitely like a kid in a candy store. After I made my choice it took it to the cast member who packaged it for me, he was an older gentelman and so very nice. We talked about it being our last day at the parks and where we were from. He took extra care wrapping it in tissue paper so we could get it home safely. I still store it in that box when the tree comes down so it will be ready for our tree the following year. I have hundreds of Disney ornaments but this one will always have a special place in my heart and on my tree. This is not ours, but one like it from the Disney Store. The only difference is our Christmas ball is clear glass and has the year 2003 on it. Thank you for joining Magical Blogorail Red this month. We will be back Friday, November 16th with an all new theme. Keep checking in with our blogs in between loops to keep up to date with our Disney info, photos and stories. If you are looking for more Disney magic, you can make your way over to The Magical Blogorail website to see all our members and their blogs, as well as all our previous loops. I am so into Disney Christmas Ornaments. Mary Ann and I love to shop for holiday decorations, which is why our favorite time of the year to visit is December. Bruce, spending a Christmas at Walt Disney World is on the top of my Disney bucket list. Thanks for stopping by!